UX One allows easy navigation of Analytic Components. Users can drill down and right-click on content and are provided options of applications to be launched. This will help to provide real time transactional information in a graphical format that is easy to read, understand, and interpret, allowing problems to be easily identified and solved. Mobile Time Entry gives employees the ability to submit their time while mobile. The biggest benefit is employees can submit their time wherever they are, whether they are in the office or working on site. Employers can also filter the options on their employee’s time card, so employees only see the options relevant to their job, creating a simpler, more efficient time entry system. Mobile Foundations applies when integrating existing or new mobile applications with JD Edwards. Users can now use Oracle Mobile Application Framework (MAG) 2.5. This is also the first release of MAF that supports the latest version of Apple XCode, XCode 9, and updates the embedded Cordova platform engines for iOS and Android. Personalized notifications can be directly delivered to the employee or group. This results in the ability for teams to stay in touch with critical projects and events concerning them, resulting in constant awareness and the ability to take quick action. Delivery orchestrations is a framework that enables digital transformation. This release includes business orchestrations to help automate a Procure-to-Pay process with a supplier portal system. Orchestration to update last status and next status of a purchase order will automatically update the purchase order's last status and next status without demanding the creation of custom modifications. Orchestration to receive purchase order information is an application that makes detailed purchase order meta data available for related purchase order documents. The meta data can then be used for related processes such as invoice submissions. Orchestration to add a batch voucher based on a supplier invoice will combine the supplier invoice and purchase order information to automatically create the supplier invoice. From here, the invoice and receipt will provide the information necessary for Voucher Match Automation to create the A/P voucher. Paid Sick Time Compliance creates enhancements in pay, deduction, benefits, and accrual set-up that will help HR and payroll administrators to follow all US federal, state, and local paid sick time laws, while also enhancing their ability to manage inception to date minimum and maximum limits. A new Balance Sheet Accounting for Lessees of Property has been created, that follows the forthcoming global accounting standard for Leases of Property. JD Edwards has developed a CSV version of the 300A log that meets the electronic recording and reporting standards of the OSHA. JD Edwards Orchestrator function, notification framework, and JD Edwards Personalized framework have been improved to further streamline internal and external business processes. The below advancements in Orchestrator have helped to simplify day-to-day business procedures and create a more user-friendly experience. Process Recorder gives developers the ability to create a form service by recording their step-by-step actions within the EnterpriseOne application. The recording process can be a single form or chain of forms and, once created, can be edited in Orchestrator Studio. Recording as opposed to manually creating the form service results in less error, less training, and allows more citizen developers to participate in the process of generating a form service. Report makes it possible for orchestrations to launch a report as an orchestration step, therefore taking the manual labor out of running the report and allowing it to run automatically. Automatically running the report enables the report output file to be manipulated using the File Transfer feature. File transfer admits an orchestration step to move a file to a given location using REST, FTP, or SFTP protocols. Dynamically transferring files allows users to perform at the same level of functionality without the development and maintenance of a custom solution. Confirmed compliance of organizations will offer a set of logged data and possible errors about specific events. This data will provide administrators the ability to analyze data and give them the power to form solutions or ideas based upon the data analysis. Orchestration Studio Version 6.1 focuses on increasing usability and enhancing for forms of service. Version 6.1 enables multiple equipment records to be created through a single orchestration and the ability to use the same form of service in different applications based on the version picked. Finally, version 6.1 automatically loads your forms of service input, saving you manual labor and time. Tools 9.2.2.4 provides users the ability to subscribe to relevant alerts and messages that will be automatically delivered to them. Assigned subscriptions permits managers, team leaders, and authoritative figures to designate messages to their team. They have the ability subscribe their employees to certain messages and choose whether the messages are mandatory or not. This allows teams to be on the same page and subscribed to the same posts without team members having to subscribe individually. Performance characteristics demonstrates how the Notification features will function under various load scenarios. The personalization framework updates will give citizen developers the power to enrich the extensibility frameworks, therefore helping customers personalize and extend their solutions art low costs. Personalization of menu exits will simplify the EnterpriseOne form. Personalized menu exits will enable individual industry roles and requirements to be met because users can show, hide, and rename their exits based on their needs. Personalization of grid labels through the Grid Format Manager will prove beneficial because you can be more specific and descriptive with your grid labels in both table and list view. In turn it will help new users easily understand the context and content of the application. 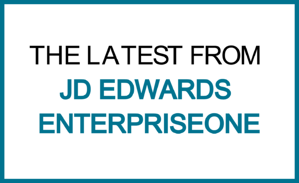 So, there you have it, a full overview of the new features Oracle has implemented into their JD Edwards EnterpriseOne system. These new tools may help streamline business procedures and create an overall more simplified, personalized, and user-friendly system that will improve your digital enterprise and drive business growth.